Bernard Darty, 83, compelled to support Wounded Warrior Project this Veterans Day in honor of his family's 1944 rescue at Normandy: "Without American troops, we simply would not have existed"
Bernard Darty, 83, is compelled to support Wounded Warrior Project this Veterans Day in honor of his family’s 1944 rescue at Normandy. At age 83, Paris-born Bernard Darty feels fortunate to enjoy time with his family and spend winters in Miami Beach nearly three-quarters of a century after escaping Nazi invaders in France as a child. Although he lost his mother to the Auschwitz concentration camp, today he is so moved with gratitude for the American troops who liberated him in Normandy in 1944 that he has made a significant donation of $500,000 to Wounded Warrior Project (WWP) this Veterans Day to help U.S. veterans and their families—hoping to trigger a new movement of supporting American veterans. "In giving this donation, I want to thank Americans with all my heart for rescuing us during the war," Darty said. "The gratitude I feel to these men is beyond words. They were saviors, doling out sweets to half-starved, war-worn children who had almost given up hope of freedom. That is why I want to support American veterans—and why I support America. I hope my donation inspires others to do the same." Darty's donation will support two key WWP programs: Warrior Care Network, which connects wounded veterans and their families with individualized mental health care, and the Independence Program, which works with warriors with moderate to severe brain injury, spinal cord injury, or other neurological conditions to ensure each wounded veteran can live as independently as possible. "We are incredibly grateful to Mr. Darty for his generosity, which will enable us to reach even more veterans, particularly those most in need," said WWP CEO Lt. Gen. (Ret.) Mike Linnington. "We serve the most critical needs of our nation's wounded heroes, including those who live with traumatic brain injury and post-traumatic stress disorder. Thanks to generous supporters like Mr. Darty, we provide them crucial support services free of charge, making a tremendous difference in the lives of wounded veterans of this generation and their families." Darty was born in 1934 to a Jewish family that had fled the pogroms in Poland for France, hoping for safety there. With the German invasion of France in 1940, however, the family was again at risk. An older brother was sent on the first convoy to Auschwitz, but fortunately survived. 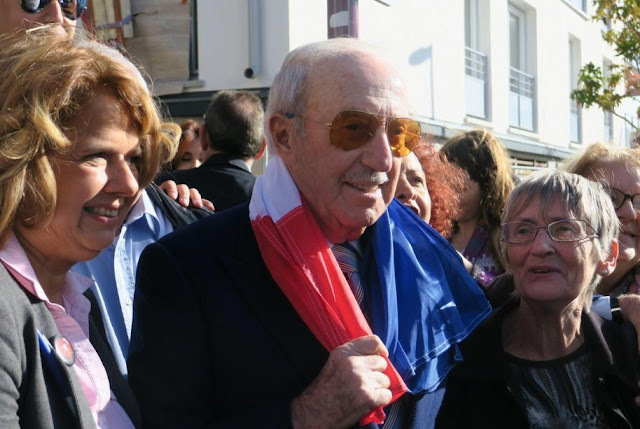 Darty's mother was not so lucky when, on July 16, 1942, the French police led a big round-up of Jews. At 6 am that morning, Darty recalls the police came to the family's apartment. Darty, age 7, was able to escape to an aunt's house that was considered safe, but his mother was sent to Auschwitz and likely died three weeks later. Darty spent the next few years living in foster homes on the outskirts of Paris, afraid and living on borrowed time. The day American troops came ashore at Normandy in June 1944, Darty finally felt the relief of freedom. That was the beginning of his connections to America. Since then, he and his wife, also a Holocaust survivor, have wintered in South Florida ever since his retirement 26 years ago—to which he says, "I have had the chance to meet many American people who I am lucky enough to call my friends. First, Americans saved us, and then 50 years later they welcomed us." Darty hopes his donation will deepen that trans-Atlantic connection, inspiring other families throughout Europe to help American veterans in deference to the shared history of the Allied forces of World War II. Wounded Warrior Project (WWP) connects, serves, and empowers wounded warriors.